Touching on switching capacity of the modern networks, the invariant rule is: the faster, the better. Of course for large enterprises, 10G network is a lower value. And more often 40G even 100G network is required for data centers. However, for individuals, small and medium-sized business (SMB), 10G network is often out of reach for exorbitant price of 10gbe switch. In this case, Ethernet switch with 10G uplink can help to achieve 10G network. This article will recommend affordable managed gigabit switch with 10G uplink. Generally there are two gigabit switch with 10G uplink solutions: 1000base-T copper switch and 1G SFP fiber switch. In the current market, 1000base-T gigabit switch with 10G uplink is usually more popular, especially with home individuals, office users and SMBs. The main reason is largely traced back to price discrimination between them. RJ45 copper gigabit switch employs existing Ethernet copper cable (Cat5e/6, etc.) as medium to transmit data, which saves one budget for matched fiber optics of SFP switch. Moreover, the 1000base-T copper switch is backward compatible with legacy networks. However, 1G SFP link owns the edges of reduced electromagnetic interference, lower latency and power consumption over copper link. For advanced users sensitive to aforesaid factors, one can consider taking gigabit switch with SFP uplink. 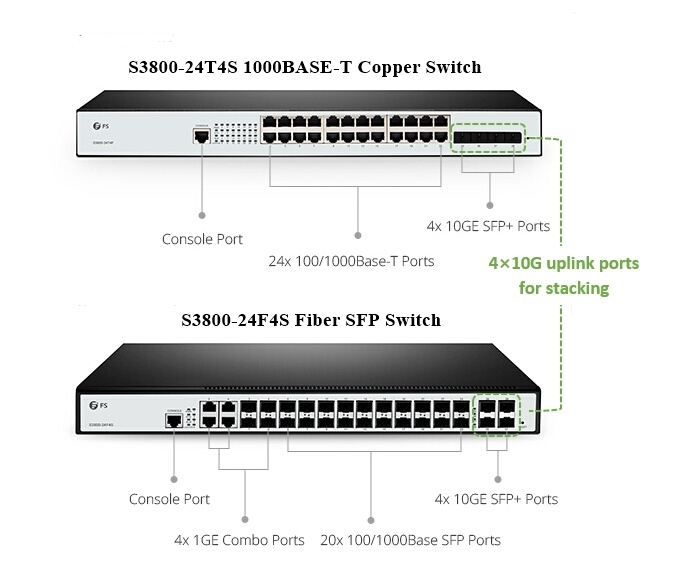 This figure shows FS S3800-24T4S copper gigabit switch vs S3800-24F4S 1GE SFP switch with 10G uplink. For 1000Base-T copper gigabit switch, here recommends both PoE and non-PoE ones for your selection guide. 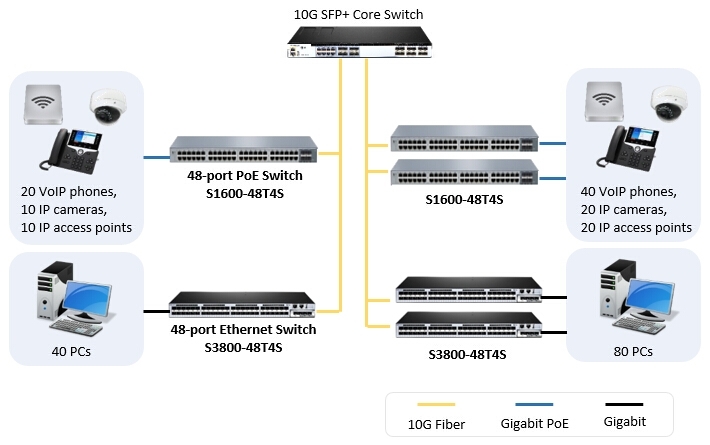 For non-PoE gigabit switch, here strongly recommends you FS S3800-24T4S 24 port switch and S3800-48T4S 48 port switch. They come with 24/48-port 10/100/1000base-T ports with 4 x 10GE SFP+ uplinks. Both of them come with single power and dual power version for selection. They are high performance Metro Ethernet switch, and designed to cater for cost-efficient gigabit access or aggregation for 10G uplink networks. For Gigabit PoE switch with 10G uplink, here recommends you S1600-48T4S 48 port PoE+ switch with 4 SFP+. The 48 port PoE switch can better fit for SMBs or enterprise class network as access switch. It can be mounted in a rack, on a wall or on desktop. One can connects it to VoIP phones, wireless APs and IP cameras for intelligent switching and network growth. Besides this 48 port PoE switch, 8 port gigabit switch and 24 port PoE switch are also available. Generally speaking, 8 port gigabit switch is suitable for home use. And 24 port PoE switch is commonly deployed in small business with few connections. Deploying FS S3800-48T4S 48 port switch and S1600-48T4S 48 port PoE+ gigabit switch with 4 x 10G uplink in access layer. For gigabit SFP switch with 10G link, here recommends S3800-24F4S. It comes with 4 x 1GE combo ports, 20 x 1G SFP ports and 4 x 10GE SFP+ ports. This 24 port gigabit switch comes with single power and dual power version for selection. For 48 port switch demand, go for S5800-48F4S. It is a Layer 2/3 switch with 4 x 10G SFP+ uplinks. The table below lists the details of these two Ethernet switches. For 10G network, deploying gigabit switch with 10G uplink can largely save you budget. No matter copper RJ45 1000base-T switch or 1GE SFP switch, you should consider your own requirements before purchasing an Ethernet switch. Gigabit switches with different ports have been recommended in this post, including 8 port gigabit switch, 24 port switch and 48 port switch. All those can be found in FS.COM with the most competitive price.